Found under the couch? Handed down from your grandparents? Traded as a kid? Collected since childhood? Purchased on eBay? -- These stories add value! You can scan them, photograph them, ship them to us, visit us at our offices in New Jersey or we’ll come to visit you! Our experts are ready to assist you NOW and help determine the current market value of your collection . . . for FREE! We can also provide you with the best purchase offer in the hobby! No one pays more! We make it easy for you to show us your collection with 4 simple methods that should work for anyone in North America! The most common way we review collections is by having you send digital scans or photographs. A smartphone, any digital camera or flatbed digital scanner is sufficient for these purposes and we've written detailed instructions on how to do so. For customers not within driving radius to meet at one of our locations, we ask that you ship us your cards. Return shipping is guaranteed and we are fully insured. We treat your cards as we would our own and handle them accordingly. We have appraisal locations in NJ and NYC Metro area as well as a specialist in the Boca Roton FL area. To meet in one of these locations or our Somerset NJ headquarters appointment are required. Sports card collections uncovered in a relative's attic or basement can be great finds but sometimes too delicate to ship. We often travel across the country (at our own expense) to evaluate more valuable collections or those too large to ship. Just Collect acquires pack-fresh collection of 1956 Topps baseball cards, which includes Mickey Mantle, Hank Aaron, Roberto Clemente, Sandy Koufax, Jackie Robinson and Ted Williams! We spent Super Bowl weekend scouring the state of Florida for vintage sports card collections. We ended up traveling over 3,000 miles, hitting three major cities, and purchasing five incredible collections! Bazookas Wild At The Valley Forge Casino! Just Collect was most fortunate to find a near-complete set of 1966 Bazooka's and the September 2014 "Philly Show" at the Valley Forge Resort and Casino. Included in the collection are 15 of the 16 panels making up that year's set, plus an SGC graded Mickey Mantle card. Check it out! Among this collection are many Hall of Fame baseball players including Tris Speaker, Ty Cobb, Eddie Collins, Casey Stengel, George Sisler and Frank "Home Run" Baker. Boxers included Jack Dempsey and several other Hall of Famers. But the key to the collection was the total of 5 Babe Ruth cards. Take an in-depth look at our most recent acquisition of two near-sets of 1940 R145 Superman cards. Check out this collection from Atlanta that we just purchased, which features a Jackie Robinson rookie card with a blank back! Take a look at this 1970 Topps Basketball card collection we recently purchased! What is lacks in star power, is made up for in quantity and condition! Founded in 2006 by Leighton Sheldon, Just Collect, Inc. has been buying and selling sports cards and memorabilia for nearly a decade. Our main office in Somerset, NJ (5 minutes from the Rutgers-New Brunswick campus) allows our team to serve all of New Jersey, as well as New York City and Philadelphia. Depending on your collection’s size and value, we can travel to you or even pay to have your items shipped fully insured to our Somerset, NJ office. Just Collect is not just another baseball card store. 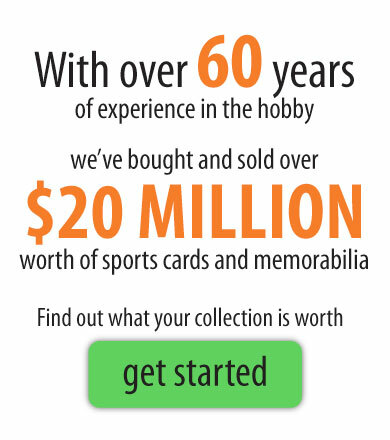 We are the nation’s top buyer of vintage sports cards and memorabilia. We have bought and sold over $20 million worth of cards since our inception. We buy collections of all types every day! We buy vintage sports cards, non-sports cards, unopened packs, unopened boxes, cases, uncut sheets and many types of sports memorabilia and autographs!